A New Zealand student will this month go up against the world’s best in Google’s first-ever global Doodle 4 Google competition. To celebrate the 2010 FIFA World Cup, Google invited young people across New Zealand to show their love for the game by designing a Google logo inspired by the theme “I love football". A New Zealand Top 10 were chosen from the hundreds of entries received, and Kiwi Google users were asked to vote for their favourite. From the thousands of votes cast at www.google.co.nz/doodle4google, 13-year-old Southland student Holly Pierce emerged as the crowd favourite, receiving nearly one-quarter of all votes. 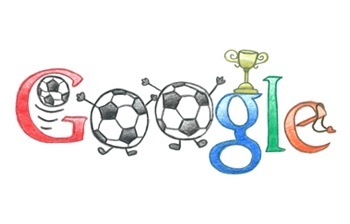 Holly’s vibrant doodle features footballs in place of the Google Os, and also incorporates a World Cup and referee’s whistle. It will be displayed on the Google New Zealand homepage for 24 hours to support the All Whites on the day of their first match on 15 June 2010, to be viewed by millions of people. Holly’s design will then be entered into the global competition, going up against the other international Doodle 4 Google winners, where people from around the world will vote for their overall favourite doodle. The winning design will be displayed on the Google homepage of all participating countries for 24 hours in July 2010. To vote for Holly’s doodle in the international competition, head to www.google.co.nz/doodle4google from June 21. Voting will be open for one week until June 28.